Sometimes I just love an excuse to bake and often I'll hunt for the tiniest excuse to do so. Luckily, just the other day I had a real, actual excuse with more depth than "the cream was on sale at the supermarket". Really, a real reason: picnic time! Spring is (kind of) in the air; there are flowers and grass (!). Unfortunately the weather isn't quite warm enough for fruit based dessert but it's always the right temperature for chocolate. I tend to forget that most people don't like dark chocolate as much as I do, so these are incredibly rich. I also tend to forgot that at picnics everyone brings sweets and so I really should make something savory to counter it. I never remember and by the end of the day I'm overloaded with sugar and wanting nothing more than an apple. Spread 1 teaspoon strawberry jam over the the base of the cooled tart crusts, set aside. Place chocolate in a medium bowl. Pour cream into a small saucepan and heat until it just beings to boil around the outside, remove from heat and pour over chocolate pieces. Sit for 30 seconds and then gently whisk to blend. If chocolate does not melt completely place the bowl over a saucepan of simmering water. Stir gently until chocolate is fully melted. 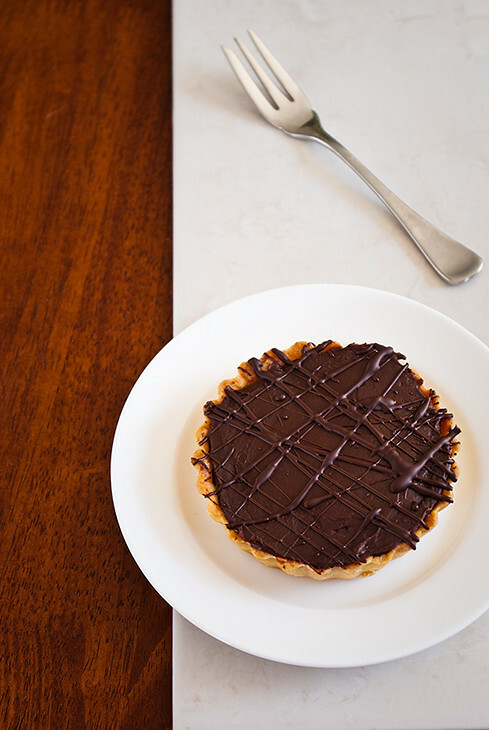 Spoon ganache into tart crusts and smooth using an offset spatula. Refrigerate for 1 hour or until set. Melt extra chocolate and using a fork flick over set ganache to create a pattern. Allow to set in the refrigerator until ready to serve.